At the completion of a series of special projects we were sitting around the studio table brainstorming their upcoming photoshoots and how best to capture the love, detail and work that we had all poured into them. 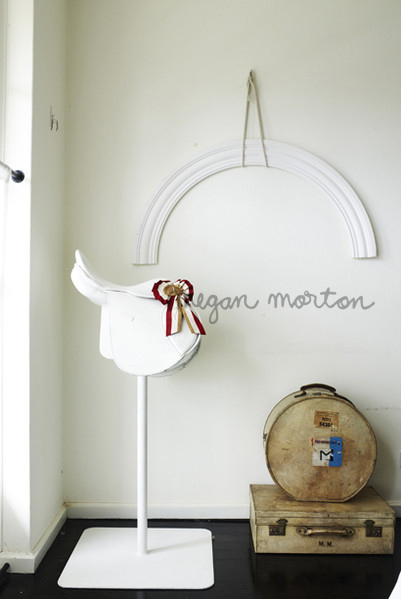 Our Studio Manager Julia had been a devotee of Megan Morton’s style and work for many years and suggested her for this collaboration. From our first interaction we were besotted with her creativity, quick wit and eye for layering beauty. We were confidant that handing our projects over to her, she would treat them with the same emotional and considered approach that we instill in our work. Megan is a maestro; the perfect conductor bringing all elements together in the most cohesive and beautiful way, adding a further layer to our interiors and allowing an even deeper emotional response to them. We look forward to working on many more beautiful projects together. I want to offer something good here, but to be honest I never actually thought much past what was for dinner that night! I did make very hilarious art projects - like puppets from paper maché, collages for light switches and unattractive coat rails from items I found in my Dad's farm shed. WHAT DID YOU DO WITH YOUR FIRST PAY PACKET? I went to Christine Mansfield's Paramount Restaurant in Potts Point and asked for a table for 1. I won't ever forget it. WHAT IS THE BEST LIFE LESSON YOU'VE LEARNT ALONG THE WAY? Muriel Brandolini, Sister Parish, Peggy Guggenheim. French desks and table lighting. And obviously anything Charlotte Perriand! Indulge in Paris in Springtime. Every Spring. I love that every single job we do is so different, so bespoke and done with heart. From the Special Care Nursery at the Mater Hospital to the super model homes, it's all with beautiful intentions.